Have you ever dreamed about having a luxury yard? Synthetic grass opens up your ability to express creativity with your yard. There are different types of synthetic grass installs that can turn your dreams into a reality. Imagine being able to give your kids the type of backyard experience that you never had. You can create a backyard of mystery, adventure, and endless fun. The best part is you will know your kids are safe and secure because they will be having fun at home. The beautiful thing about different synthetic grass installs is that everything doesn’t have to only be for the children. You can build yourself a world of relaxation and adventure as well. After long days of work or weekend nights, smelling the fresh air while the tree leaves sway in the wind is just the type of scenery you need to end your day. Even though you have synthetic grass, you can still enjoy the beauty of a plant container garden. Plants are wonderful to have around the house and even more wonderful to have in a group outside. You can place them in the front of your house or in your backyard and they will still bring a smile to your face every time you see them. They are great for the environment and they add style to your home. There are two main options to choose from when building a plant container garden. You can build a really large container with plants or you can gather multiple containers and place them in the same area. If you are planning on primary planting one specific plant we recommend the large container with multiple plants in it. However, if you would like to have a variety of plants having multiple containers would be best for the plants. Swimming Pools and synthetic grass go together like peanut butter and jelly. They are the perfect combination. Having a pool in your backyard can be difficult with cement or regular grass. With cement, once the water hits the pavement it becomes an unsafe and slippery area. Also, when the sun is beaming high in the sky the cement becomes hot and hard to walk on. On the other hand, with regular grass surrounding your pool, you have to worry about a muddy disaster. As kids jump in and out of the pool water splashes over the sides and make the regular grass soggy. This is very unsafe and it can cause irritation with the insects in your grass causing them to come to the surface or even worse end up in your pool. Synthetic grass provides a beautiful landscape around your swimming pool and adds an extra layer of safety. The sand infill assures a slip-resistant poolside surface to land on and the superior 100% permeable artificial grass backing drains fast and clean. • Easy installation: Installs directly over any poolside landscape surface or flooring without nails or glue to create a soft, poolside landscape artificial turf grass solution. • Safety: A cushioned surface and gritty sand infill make for a slip-resistant poolside surface. • Durability: Artificial grass landscaping around pools are designed to last 15-20 years. In 2017, most kids play video games, watch TV, or are glued to their electronic devices all day. One of the main reasons for this is because of lack of outside entertainment. We all want our kids strong and healthy, which means we have to add some exciting value to their lives. Putting a jungle gym in your backyard could be the key to your child’s healthy future. Most parents’ problem with installing a jungle gym is the fear of their kid getting hurt or bitten by insects. 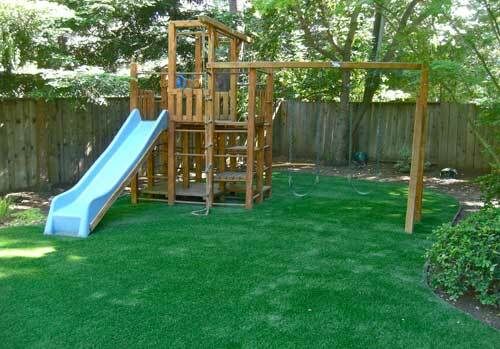 Traditional playground surfaces like grass, gravel, woodchips and dirt are unsurprisingly dangerous for everyday play, and more schools, cities, and homes are making the transition to synthetic grass. face, temperature-cooling technology by reflecting infrared rays, and doesn't become slippery when water hits it. Also, it doesn’t have insects and bugs crawling all over it. Synthetic grass is the answer to your prayers and can help you create a safe and fun environment for your child to have fun exercise. Patios can be the best place at your house to hang out. Whenever family and friends come over it’s always a good time when you sit outside and talk on the patio. Synthetic grass is a great addition to your patio to enhance its value. Not only is the grass soft to the touch, but it also adds a warm feel to your patio. It gives you the feeling of having grass under your feet without the work of maintaining a large yard. If you accidentally spill or waste something you can easily pick it up and hose off the synthetic grass. The best part is, unlike regular grass, you don’t have to worry about ants and insects crawling to the smell of food. Lastly, you can simply use synthetic grass to accessorize your patio. You have the option to be creative and cut smaller pieces of synthetic grass to fit under potted plants or make pads for underneath your patio furniture. The truth is, you can be as creative as you want to be. Let your imagination guide you and bring your ideas to life.